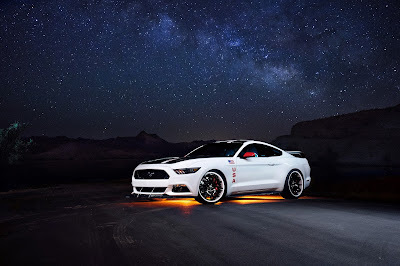 BRIGHTON, Mich. - In celebration of the successful history of the Apollo space missions, Ford introduces an Apollo inspired, limited edition Mustang that will be auctioned off at a charity auction this month! The auction will be to benefit EAA youth aviation education programs, including the Young Eagles, which Ford Motor Co. has raised about $3 million for in recent years. As far as limited-edition Mustangs go, this one is the King of the galaxy! This will be the eighth straight year that Ford Motor Co. has created a unique, aviation-inspired pony car to benefit the Experimental Aircraft Association youth education programs. The Apollo-inspired Mustang will be donated and sold via auction on July 23rd at the Gathering of the Eagles event at EAA AirVenture Oshkosh 2015, which is the "World's Greatest Aviation Celebration". This space shuttle of a car will also come with an impressive array of performance enhancements that include a performance package, Ford Performance supercharger and shifter, X-pipe with side and rear exhaust, sport-tuned suspension, six-piston Brembo brakes and custom Forgiato 21-inch performance wheels. The Space Shuttle-inspired design also carries over to the interior of the vehicle, which includes performance gauges, a modified instrument cluster, and unique embroidered elements in the seats, trim panels and floor mats. If you want the opportunity to see or bid on this beautiful vehicle, it will be on display in the Ford hanger at EAA AirVenture Oshkosh 2015. To bid and participate in the auction you must pre-qualify by contacting EAA development office, (800)236-1025 or by donor@eaa.org. If you would like the chance to obtain your own Ford Mustang, stop by your local Fowlerville Area Ford Dealer to check out our inventory of new and used Mustangs! Brighton Ford is located at 8240 Grand River Ave. just north of I-96 in Brighton. We are a family owned and operated business that strives for customer satisfaction. For more information on Brighton Ford visit BrightonFord.com or give us a call at (800) 836-8206.